Replacing your mattress can be very expensive, so a mattress topper is a great way to revitalize or change the style of your bed instead. With some careful research, the right one will give you what you need at a fraction of the cost of a brand new mattress. In this article, you’ll find both a list of the key factors which can help inform your decision making, and also a breakdown of the pros and cons of each type of material. By cross-referencing the two sections, you’ll hopefully have a clearer idea about which type will be the right kind for you. Mattress pad or mattress topper? First of all, it’s useful to understand that there can be some confusion between mattress pads and mattress toppers. A mattress pad tends to be thinner, and usually serves either to protect the mattress or to provide only a little extra softness. 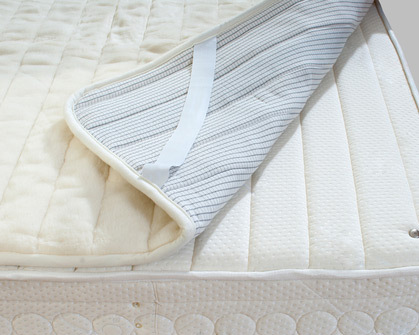 A mattress pad can address specific needs, such as adding a waterproof layer or an anti-allergy feature. You can also find heated pads for use in the winter, and cooling pads if you have issues with heat. As a rule of thumb, a mattress pad tends to be thinner than a topper. A mattress topper will usually add a more significant layer of softness, cushioning or support for your body. You can even use both at the same time to further improve the quality of your bed. By placing a mattress pad over the topper, you can help protect both the topper and the mattress. Having said that, some companies use the terms interchangeably. They may call their product a topper or pad, but it’s actually much thicker or thinner than you would usually associate with that category. So it’s always worth checking how much padding it actually provides. With so many types of mattress topper, it’s perhaps more helpful to first decide what you want or need from a topper. Then you can work out which material will best meet your needs. Personal preference and a gut feeling will probably play a role too. But if you like to weigh up the pros and cons, here are some of the key factors to take into account. A higher price doesn’t necessarily guarantee it would be better for you personally. It’s about meeting your needs, not simply buying the most expensive you can afford. 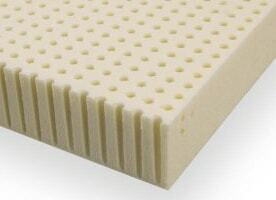 Plain egg crate foam, polyester and some cotton toppers tend to be the cheapest. With higher quality cotton, feather and down in the middle. Memory foam and wool can be quite expensive, with latex even more so. If it’s extra support for your back and limbs that you need, memory foam and latex are usually more effective than the other materials. They are better at holding the shape of your body and supporting your natural posture. With such a dizzying range of materials, brands, densities and thicknesses you should be able to find the perfect level of softness and comfort. But your definition of comfort may be different from the next person’s. Would you prefer a topper which molds to your body, such as with latex or memory foam? Or are you more suited to a naturally soft material such as down or cotton? In many ways, achieving softness is much easier than firmness with a mattress topper. You could try a low density memory foam topper, or one of the many relatively inexpensive fabric toppers which literally just add an extra layer of soft material. Toppers tend to fall in the range of between 2 and 8 inches thick. If you need to revitalize an aging mattress, sleep on your side, or if you weigh more than average, you may need to look at thicker options. The materials with the best range of thickness are memory foam and latex. In addition, the density of a topper is important in determining how much support it will provide you. 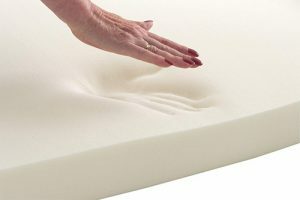 Memory foam and latex toppers tend to have the most choice, allowing you to find just the right comfort level you need. See the memory foam section below for more information about thickness and density. Memory foam and latex are good at reducing the transmission of movement from your partner. So if you sleep with someone whose tossing and turning keep you awake, they are good choices. Memory foam and latex mattress toppers tend to retain the most body heat. The thicker and denser they are, the hotter they can feel, despite the attempts of manufacturers to add elements like gel cooling or ventilation tubes. Wool, down and feather toppers are good all year round, as they provide extra warmth in winter yet reduce heat in summer. Don’t forget that the outside material can also contribute to the temperature by wicking away sweat. Some materials are better for certain allergies, so it’s worth checking the list below. Some are also more resistant to bed bugs, mites, mildew and mold than others. Remember that you need to remove it from the packaging, get it onto the bed and potentially remove it for cleaning. So do be aware of the overall weight of the mattress topper. Egg crate is the easiest to transport, whilst feather, down and cotton are easier to move than memory foam or latex. Feather and down are the most difficult to clean. The standard warranty time seems to be around 2 years for many mattress toppers. But this can be as short as one year and as long as 5 years. But remember that you won’t get a replacement just because it’s compressed under your weight over time. Mattress toppers come in a range of very different styles and materials. So it’s important to know both what you hope to gain from using a topper, and what the pros and cons are of each material. Let’s take a look now at the different types to give you a better idea of what your options are. Latex toppers tend to be expensive, but like memory foam, can provide excellent support and comfort. Natural latex is made from the liquid in rubber trees. Not all latex toppers are natural though, so be sure to check before buying if it’s important to you to avoid synthetic materials. Excellent at providing comfort and pain relief by either hardening or softening your mattress. Usually firmer than memory foam, but still feels soft. Different materials available, including synthetic or eco-friendly natural latex. Excellent at preventing motion transmission from your partner. Not good for people with a latex allergy. Can feel hot in the summer. Memory foam is one of the most popular choices of both mattress and mattress topper nowadays. A high-end memory foam mattress can be incredibly expensive though, so a topper is a good way to get some of the benefits of memory foam without breaking the bank. The memory foam will conform to your body, providing a supportive and relaxing surface to sleep on. It can provide support if you have joint, muscular or back pain. It helps reduce how much the noise and movement of a restless partner disturbs your sleep. You can get it in a range of densities, so you can find the right firmness to suit you. It’s durable, hopefully lasting for many years to warrant the higher price. Memory foam sometimes has quite a strong chemical smell at first, though it dissipates after a few days. You may find it holds body heat, so if you tend to overheat, look for a breathable memory foam topper. Whether you’re looking at memory foam mattresses or memory foam toppers, you’ll find a confusing range of thickness and density options. It’s useful to understand that both elements affect the level of comfort and support. The spectrum of thickness and density keeps expanding, but let’s take a look at the difference between the most commonly found figures of each. The choice of density of a mattress topper is very important, and is measured in pounds per cubic feet, or kg/m3 in some countries. Most toppers have a density ranging between 2 and 6+ pounds per cubic feet. Higher density usually means higher cost, but also much better support for the body and longer-lasting conformity to your body shape. 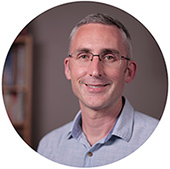 3 pounds or under per cubic feet – will feel much softer and less supportive than higher densities. Your body will sink into it faster than higher densities. More light-weight and easily transported too. 4 to 5 pounds per cubic feet – a good option for most people, providing a balance of soft, yet supportive surface. Will mold to your body a little slower than lower densities. 6+ pounds per cubic feet – better for people who have medical needs and/or in need of a high level of support for the body. Will take longer to conform to your body shape and weight, and support you for much longer than lower densities. And if you’re a heavy person, a higher density might be a better choice so you can benefit from the extra support for longer during the night. 1 to 2 inches – usually provides a little extra comfort, but can be quite firm if the density is also high. Good for those with a firm mattress who just need a little extra comfort and support for the body. 3 inches – a popular choice if you’re not sure which thickness to choose. Provides a good level of softness and support. 4 inches – provides even more support for the body parts that most need it. So now we have a rough idea of how density and thickness affect the comfort and support, how do you choose the best combination? A rule of thumb is that higher density means you can get enough support with less thickness. But a 2 inch topper with a low density really won’t provide much support and could be too soft. Likewise, a very thick topper with a very high density might prove unnecessarily firm, not to mention heavy. Try a thinner 2 or 2.5 inch topper with a high density of 4+ pounds. That will provide good support (the density) but stop you sinking into the topper in an uncomfortable way (the thinner material). Try a medium thickness of 3 inches to get more support for your back and limbs. Then either a low density of 3 pounds to add some softness, or a higher density of more than 4 pounds to provide firmer support if you prefer that. The reality, however, is that with the huge range of material types, additional layers and variation of manufacturing between countries and companies, it’s hard to predict exactly how a mattress topper will feel. So it’s worth asking in advance if the company can offer advice based on your size and needs. And if you can try one in a store or they have a returns policy if you’re not happy with the topper. At the opposite end of the material spectrum is the natural material of wool. It can be fairly expensive too, but there are some good reasons for this. It’s a naturally soft and comfortable material. It’s durable, often lasting for many years. It’s ideal for allergy sufferers who may have problems with synthetic materials. Bed bugs and mites generally stay away from wool. Good for keeping cool in summer and warm in winter. More expensive than other other fabric materials. Doesn’t provide the same cushioning as memory foam. Bedding made from goose or duck feathers, or softer and more luxurious down, is known for its softness and comforting feel. If you’re an allergy sufferer or need a firmer topper though, it may not be right for you. That soft, luxurious feel that many people have come to love from down-filled duvets and pillows. Durable, often lasting for several years. Good temperature regulation in the summer and winter months. Not ideal if you need a firmer topper to help with aches and pains. May not be thick enough to disguise a lumpy mattress. Risk of feathers eventually poking through, though good quality toppers are designed to avoid this. And down should minimize this risk compared to feathers. May need fluffing to keep shape (getting a segmented topper can help with this). There’s a vast range of mattress toppers and pads made from cotton, and often with a mixture of cotton, polyester and other materials. The price can also vary greatly with these. The possibility of finding extremely soft high-thread count material. Range of options from synthetic to organic. Often easier to clean than other materials. Polyester toppers can be very affordable. Not as durable as other materials like latex, wool and memory foam. The cotton is more likely to compress in a shorter time. High-quality cotton can be quite expensive. Egg crate mattress toppers refer to the shape, specifically the little bumps as you can see in the photo. It’s important to note though that you can get an egg crate topper made either from good quality memory foam or from more basic foam. Because of that, the price can vary a lot for products which may appear identical at first glance. Since we’ve already looked at memory foam above, let’s have a look at what you get from the more basic foam models. Since it’s made from foam, it might not provide the same luxury as other types, but it’s a good choice if you’re on a lower budget or are using it for camping. Generally cheaper than other types of material. Light-weight and thin so it’s easy to roll up and transport. Good to use for camping or holidays. Can be placed on top of each other to get a thicker padding. Doesn’t provide as much padding or comfort as other materials. Less durable and can start to fall apart with frequent use. Can be warm in the summer months. For some specific recommendations of excellent mattress toppers in each category, you might like to read my mattress topper reviews. If I get a wool mattress topper would it be really soft and how thick does it need to be? It depends – in theory, wool toppers can be soft. But manufacturers also make firmer ones. So you’d need to check what they say about it. The thickness will also depend on the manufacturer – 3 inches is probably a good minimum to aim for. This article has really given me some knowledge! My fiance and I just purchased a new mattress. He likes firm and I like soft. We ended up getting a medium mattress. He likes it, but I have had trouble sleeping because it is too firm. He says we can exchange for softer but I was thinking a solution could be a topper. It will give me soft yet have the firm support from the mattress he needs. I wanted to get a 4″ gel memory foam and fiber one. It looks like it is memory foam inside of down feather. I would love a recommendation. Its not easy buying what we need when we dont even know what will work! Thank you! Thanks for your comment. Are you think about getting a single topper to sit on one side of the bed? That could work, but would obviously create a ridge in the middle. But if you don’t mind that, then yes, a topper to soften one side should work. You’re welcome. I’d say it depends on the density of the memory foam you choose. You can get softer memory foam. But you’re right in that its not great for hot weather. Have you thought about trying a fabric instead? Sometimes just a couple of inches of a softer fabric can help soften the mattress considerably. See if any shops where you are will give her a no questions asked trial period. Many companies do these days. Hi the article was very helpful, thank you. Can I ask, would it be a problem if the mattress topper was lets say 10cm longer than the mattress? I think it depends on the overall size, and the type of topper and mattress. I think the main issue will be an aesthetic one, and getting a sheet to fit nicely over the top of both topper and mattress. Then perhaps the risk of sitting on a surface you think will support your weight, only to dump yourself on the floor! I’m 6 months pregnant and in the hospital (possibly long term), the bed is very soft and makes my hips hurt, I want a mattress topper to try to help. How do all these factors change with an extra soft mattress? Sorry to hear you’re facing a long time in the hospital. Are you talking about bringing a topper into the hospital, or for home when you are out? I have recently moved to a fully furnished flat. The bed i now sleep on has been causing me so much pain. I sleep completely comfortably, right through, however when i wake up my back is so stiff and sore i can hardly move. I have found a duck feather topper that i can afford, am I wasting my time? It’s impossible to say! The thing is, for some people too soft causes pain, and for others too firm. I guess it depends what you’re trying to achieve whether the topper you bought is the right choice or not. Does it have a returns policy? We have had a Tempurpedic mattress with a built in 2″ topper for many years. It has always seemed a bit too firm for me but my husband likes it. I sleep on my side and have scolosis of my spine. My back hurts so much when I get up in the morning that it’s terribly painful. What kind of a mattress topper might help? I can understand the frustration if you wake up in pain every day. What material is the topper section? Hi Ethan, I just got a (used) futon and it is so hard and uncomfortable I’m beginning to think I’d sleep better on the floor. I can’t really afford to replace it and so I was wondering what topper would be best to remedy this. Oh, sorry to hear that! I’m not a fan of futons for that reason – they are always too hard for me. If you’re on a budget, you could try an egg-crate topper as they tend to be quite low price. What happens to egg crate toppers over time? Do they breakdown? Do they retain pieces of sloughed-off skins, etc.? I start mouth-breathing and get a dry cough and other signs of allergic reaction during a guest night at relative’s home. The egg crate foam topper is thin about 2 inches thick and probably 10 years old. Could it be time to get a new topper? What is the usually life time of a thin, inexpensive egg crate mattress topper? Thanks for your comment. I think up to 3 years maximum on average. So your relative’s 10 year old topper is probably long overdue replacement. Hi. We are both in our 60’s and subsequently experience our share of aches and pains. I also have back and neck issues and fibromyalgia. After a lot of research, we recently invested in a 100% latex mattress and two pillows from a reputable Australian company-quite an expense! Initially, we both found it uncomfortable, but my husband has quite quickly settled in and finds it quite comfortable. I am a light sleeper and find the partner disturbance no less than our old bed, but my biggest concern is that I am having difficulty adjusting to the new bed and pillow. How long should it take to ‘break in’ the new latex mattress and pillow? I slept on a holiday mattress recently with a very soft padded top and it was so comfortable. I was wondering if I should I be considering a soft mattress topper? Any advice would be appreciated. We really can’t afford to replace the mattress and I would be very nervous about what to buy. Thanks for your comment. It might take up to a month to break in, so I would push it to the return date and see if it gets better. You could consider putting a softer mattress topper over it to soften it if there’s still no improvement for you. What’s the best topper to help reduce pain in shoulders and hips that seems to get worse while in bed? I would look at getting a memory foam or latex topper and choosing a firmer option. See if you can get one with a trial period to give it a go and see if the firmness works for you. Thanks for your comment. That’s a very difficult question to answer! I think there’s a bit of both involved. The main complaint is that they can be cooler for a while, but certainly not miraculously cool all night long. My advice would be to read customer reviews on sites like amazon to check what others have said about the one you’re thinking of buying, assuming it appears there. You can’t beat the views of people who have no reason to hype a product they’ve bought! Thanks for the article! A new mattress is not in our budget but ours is the worst! I wake up every morning with back pain and I am a stomach sleeper! Looking to spend some money on a decent topper, our current mattress is very soft. Having trouble deciding if we should go firm topper and what thickness… thoughts? You’re welcome, and thanks for your comment. 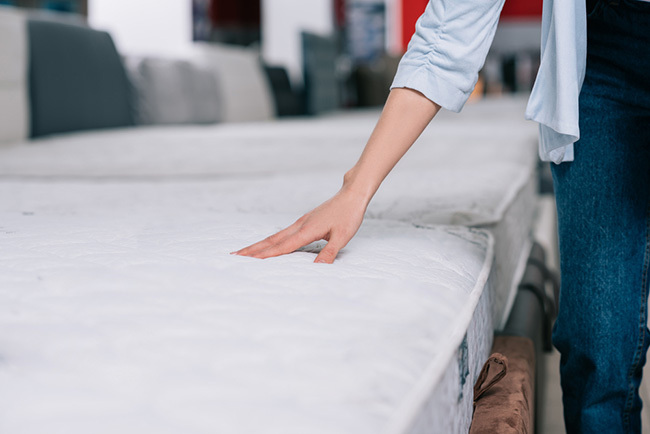 If your current mattress is really soft and sagging, perhaps it might be worth saving for a new mattress rather than risking a topper just not being able to firm it up properly. Alternatively, you could try one that has a returns policy, so you don’t risk splashing out on one only to find it doesn’t cover the softness properly. Part of the problem is that although some toppers can be quite inexpensive, the ones that tend to be firm also tend to more expensive. It’s cheaper to soften than it is to firm, so the expenditure might still be a lot. We used to have a memory foam mattress which made me super hot and hindered, rather than helped, my husband’s back issues. We decided to try and deal with both problems and got ourselves a wool futon. We’re not new to futons and know they can be hard, but in the past, I never ended up suffering from shoulder pain like I am now. Since our futon was rather expensive, we’re thinking about adding a topper rather than thinking about replacing it. I am leaning toward a latex (even though I know they *can* sometimes run hot) because it’s natural and durable. I’m not sure which one to get though … I’m assuming a 3″, to help cushion my shoulders, but should I choose “soft” or “medium” …? Because “latex runs on the firmer side” generally, I’m thinking soft even though I am naturally inclined to choose medium. Thanks so much for any help/ideas you can provide. I want to get it right so we can both start sleeping well again. Thanks for your comment. I can understand why you’d be thinking soft over medium, and I don’t think that’s bad idea considering how hard your current setup is. Considering how you must already be disappointed, my feeling would be to try to avoid further problems. I’d be very careful to check that there’s a returns policy. That way you can always try a soft one, and if it’s no good after a week, send it back. It can take a while for pains to resolve if it’s the bed that’s causing it, so if you can trial one for a week or two, that would be ideal! I’m wondering if mattress toppers (specifically wool toppers) can be washed and if yes then what the best method of washing is. I’m potentially interested in getting a wool mattress topper but I have cats and just in case I need to know what I’m getting into re: washing/drying needs of a wool topper! Thanks for your comment. Mattress toppers can’t usually be washed because of their size, and wool toppers definitely can’t as it will ruin them. The secret is to get a protective cover to make sure it doesn’t get dirty in the first place. Thanks for your comment. How long did you try the mattress on its own for, and then with the mattress topper? Sometimes it takes a while to get used to a new firmness. And can you take either back for a refund or replacement? I run a B & B and two of my guests commented that the mattress is hard I mean firm. I actually chose the firm mattress and its good for our back but I’d like to consider buying a mattress topper to add a bit of softness. I don’t know anything about mattress topper , I only use mattress protector. Do you have any suggestion what type I should buy for our B & B guests? Many thanks. Thanks for your comment. Well, it depends which country you’re in, as you can’t buy the same mattress toppers all over the world. I’d say that temperature also plays a role, as you don’t want to add too much heat if it’s in a warm region. And of course cost – how much you’re willing to pay. In my experience of staying in hotels, they tend to go with cheaper cotton or polyester toppers – presumably to save money and add some softness without going too overboard. Hi. I want to buy a mattress topper to use on my bed. I have an electric heating mattress pad that is on my bed all the time, but only used in the winter. Suggestions for a topper. Thanks. Thanks for your comment. Do you mean one that you can use for the other 3 seasons in place of your electric topper? How comfortable do you find that topper? Do you feel you need firmer, softer? Hi Ethan, thanks for your very informative article, I found it very helpful. I especially appreciate the comparison. Question for ya, if thickness doesn’t really correlate to firmness than what does thickness provide? The thicker the better it masks a lumpy mattress? Also, if you were heading to college and had to make a choice which topper would you buy? My parents are paying so money is not a factor…to me at least! Thanks in advance Ethan…much appreciated. Thanks for your comment, and it’s nice to know the article was useful. Thickness and firmness can be confusing. One rule of thumb is that generally a thicker mattress topper can end up feeling softer. And if you’re a heavier than average person, you might find it’s a good idea to choose a thicker topper of your chosen firmness to help offset the effect that your weight will have. But if you choose the thickest, it also then runs the risk of extra sagging. So if you need a firm support for your body, thicker doesn’t necessarily mean better. There’s also a sad fact in that some companies make very thick toppers and mattresses because they appear more luxurious, and therefore more expensive! So some experts say there’s no real need to splash out on extra inches of topper or mattress. Having said that, you might be right in that if the base mattress is in really bad shape, a thicker topper will do a better job of masking it. As for going to college, well that’s a tricky question! It’s a personal choice really, but I’d also think about how long you’ll have that size bed for, how easy it is to transport, and what type will suit your needs best. If you can, go and try some out in a store, then make your choice. Or even ask family or friends if they have toppers and see if you can try them out for a minute! I want to buy a memory foam firm mattress topper. The firmer the better. Should I choose 2′, 3 or 4 inch to ensure that it is really firm? Thanks for your comment. The firmness is a separate point to the thickness to a certain extent. Are you able to go to a local mattress shop and ask to test out some toppers? That’s a good way to find out what might suit you best. Thanks for your comment. Unfortunately, if you have bed bugs, there’s not a lot that will prevent them from hiding in spaces around the bed, despite what some manufacturer’s might say. So even if they don’t nest inside the topper itself, they might end up in the space between the topper and the mattress. If you have a problem with bed bugs, they need to be dealt with properly, no matter what topper you have. Be sure to buy deep pocket sheets that will not only cover the entire mattress, but cover the mattress topper as well. Thanks for the comment, and that very useful tip! You’re welcome – I’m glad the article was useful.